When in the Course of human events, it becomes necessary for one people to dissolve the political bands which have connected them with another, and to assume among the powers of the earth, the separate and equal station to which the Laws of Nature and of Nature’s God entitle them, a decent respect to the opinions of mankind requires that they should declare the cause which impel them to the separation. We hold these truths to be self-evident, that all men are created equal, that they are endowed by their Creator with certain unalienable Rights, that among these are Life, Liberty and the pursuit of Happiness. . . The Declaration specifically refers to God four times. The last of these appeals to “the protection of divine Providence.” What did Thomas Jefferson, primary author of the Declaration, and our Founders mean by Providence? One meaning that was universally understood due to the ubiquity of The New England Primer in early America is found in the catechism that was often contained in it. Question #11 of the Shorter Catechism asks, “What are God’s works of providence?” The answer given says, “God’s works of providence are his most holy, wise and powerful, preserving and governing all his creatures and all their actions.” For our Founders, Providence meant the intervention of God in the affairs of men. Let us, then, with courage and confidence pursue our own federal and republican principles. . . .enlightened by a benign religion, professed, indeed, and practiced in various forms, yet all of them including honesty, truth, temperance, gratitude, and the love of man; acknowledging and adoring an overruling Providence which by all its dispensations proves that it delights in the happiness of man here and his greater happiness hereafter. I shall now enter on the duties to which my fellow-citizens have again called me. . . .I shall need, too, the favor of that Being in whose hands we are, who led our forefathers, as Israel of old, from their native land and planted them in a country flowing with all the necessities and comforts of life, who has covered our infancy with His Providence and our riper years with His wisdom and power, and to whose goodness I ask you to join with me in supplications that He will so enlighten the minds of your servants, guide their councils and prosper their measures, that whatever they do shall result in your good, and shall secure to you the peace, friendship and approbation of all nations. Thus the founders’ Declaration containing a mutual pledge of life, fortune and sacred honor was made with a firm reliance on the protection of God’s intervention on their behalf. 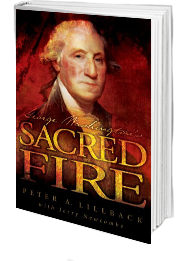 Our founders believed that government itself was in some measure a faith-based institution! To read the full text of the Declaration of Independence, click here.